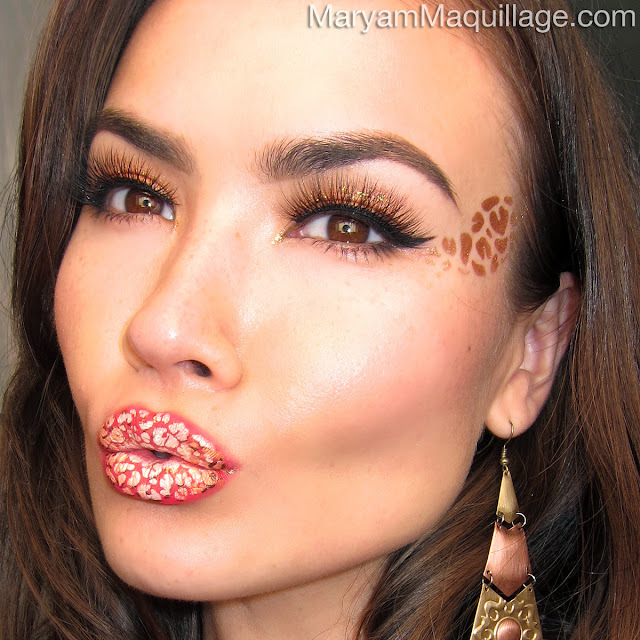 Maryam Maquillage: Dinair-brushed in Leopard! Leopard Eye Stencils, NEW liner stencils & my NEW Brilliant DIVA Compressor! I started with clean, exfoliated, dry lips. For the base color, I used 2-3 drops of Dinair Airbrush Makeup in (Fantasy) Red -- a true primary red -- and sprayed the surface of my lips while keeping the the airbrush about an inch away from the skin. For this step, I sprayed the color free-hand, to keep the edge somewhat diffused (this makes the lips look fuller). TIP: To keep the coverage as even as possible, smile while you spray to stretch out the natural wrinkles in the lip tissue. 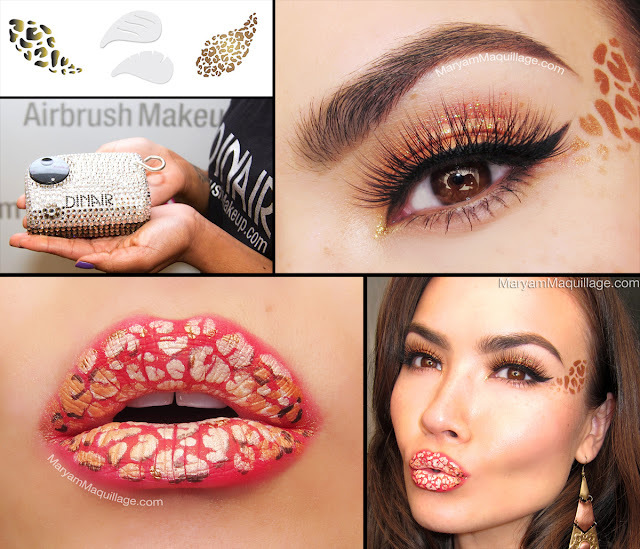 Next, I applied the Micro Leopard Stencil and sprayed a mixture of Gold and Barely Pink (Shimmer) Shades over the center of the lips. 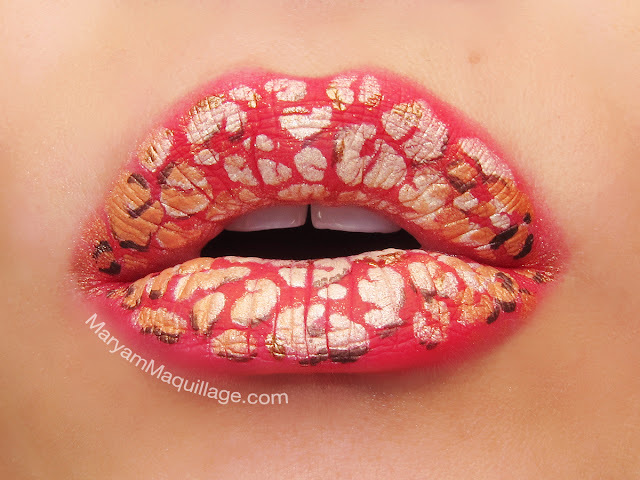 I used the Harvest Pumpkin (Shimmer) Shade over the corners of the mouth. 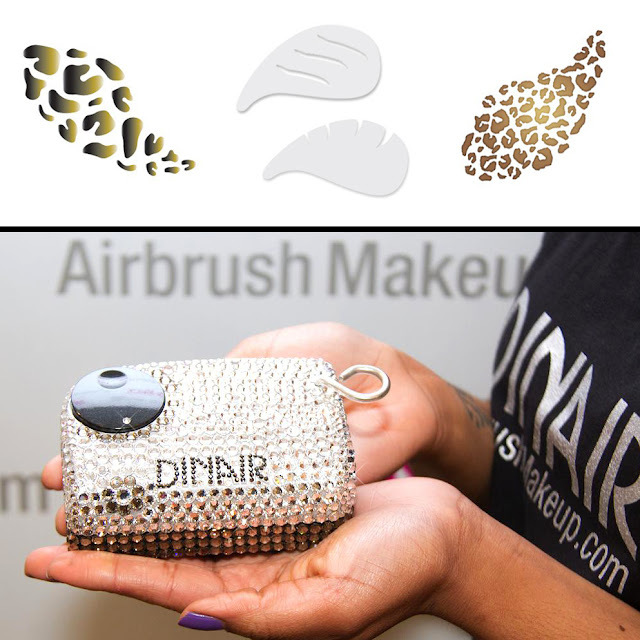 TIP: While spraying on the design, I find that it helps to keep the lips in a natural position with a slight pucker. Next, I removed the stencil and used a free-hand spraying technique to fill in some of the lip crevices. To define the spots, I used Lancome Artliner in Brown and Cinnamon. For the lid color, I used Harvest Pumpkin (Shimmer) Shade and Gold (Shimmer) Shade over the inner corner. Next, I applied the widest full eyeliner stencil over my top lash line and used Jet Black (Glamour) Shade to fill in the liner. To extend the outer wing even more, I added the second largest wing extension liner and filled it in using the same shade. 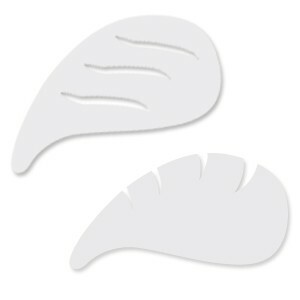 I used the same stencil to extend the tail of my brow. TIP: These stencils are so easy to use that you can even incorporate them in your every day makeup using liquid liners and pigment shadows! For the leopard design on my temple, I used the Baby Leopard Spots stencil and Light Bronze (Shimmer) Shade. 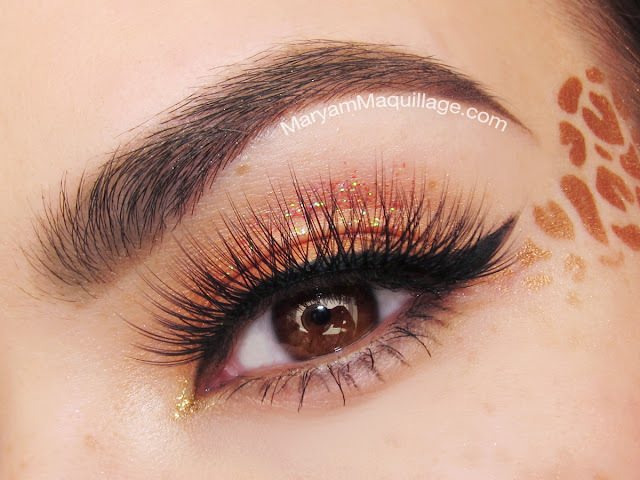 To complete this easy cat eye look, I added NYX glitter liners in Red over the lid and Gold to the inner corner of the eye and finished with a pair of gorgeous new Pixie Luxe lashes from House of Lashes. My brows are defined using Anastasia Beverly Hills Brow Wiz in Medium Ash. Oh I love this! You did amazing job. Amazing! The lips look fantastic! Wooow, the eye make-up is gorgeous <3 Maryam, you are the best!! I looooove it! You always leave me speechless. PERFECT!! this is simply amazing! it makes life easy...cant wait to get my hands on it!! Wow!!! This is ao amazing! Love the makeup for it is so unique and classy. Love the lips! These are so beautiful. If you are in Singapore I definitely wanna have some special touch up from you. This is simply amazing! It makes life easier ...... can not wait to get my hands on! You look gorgeous and those lips are fantastic! Fun! I love the trick about keeping the lines around your lips more diffused, it looks very pretty!